David Bain's psychic detective Will Castleton (Death Sight, The Castleton Files) investigates C. Dennis Moore's haunted town of Angel Hill (The Third Floor, The Ghosts of Mertland)! You don't have to be familiar with either author's previous work to love this occult mix of action, darkest fantasy, mystery, psychological suspense and noir. Paranormal investigator Will Castleton's psychic friend Mazie calls on Will to accompany her when she's forced to return to her horror-infested hometown of Angel Hill, Missouri - a town she fled decades before, having been psychologically shattered by a harrowing vision in the woods. A death in the family pulls Mazie back to Angel Hill, but soon after stepping foot on her native soil, she and Will are caught up by spectral forces that twist a ghastly crime from the town's past into an all-too-terrifying present. Where does Return to Angel Hill rank among all the audiobooks you’ve listened to so far? This book rates for me among the top. This was an interesting book. Took me days to write this review; and I've listen to others since then. Yet, story is fresh on my mind. What was one of the most memorable moments of Return to Angel Hill? Plain scary. Scary town, ヾ( •́д•̀ ;)ﾉ scary stories about the town, glad Mazie was there to give me a laugh. Knowing what the cult was doing, and why, and their road to destroying evil; the entire book is memorable. This book would make for a great movie. Yeah, "Return to Angel Hill" is a great title. An Excellent Will Castleton Novel; Loved it. 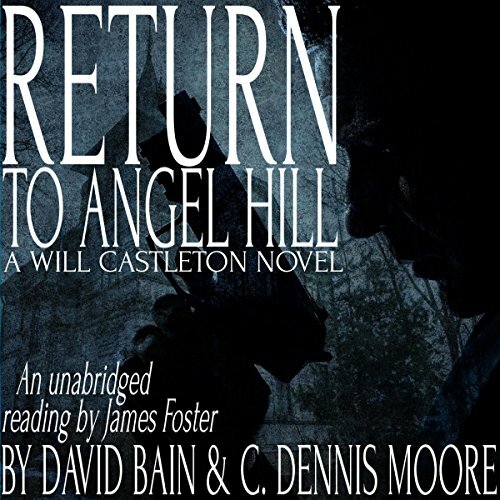 RETURN TO ANGEL HILL was a smart and thrilling audiobook with Will Castleton, who's a paranormal investigator. I really like this character. He's strong, charismatic, and pretty cool. I also loved Mazie, his friend and sort of sidekick who was also an awesome character. The story was indeed suspenseful with Will's friends new baby and him and Mazie having to return to Angel Hill on the fly. There were many places in the story that were intellectual along with some lightheartedness. The phrase from Tombstone was pretty cool and fit perfectly. Overall, I enjoyed listening to this story. This was a strong link in the Will Castleton series. JAMES FOSTER is one of the best voice actors I've listened to and he never disappoints. I'm a huge fan of all his work and by listening to even just the sample, anyone can tell why. He channels the characters in this story very well and has a way of drawing the listener in rather quickly. I think it's fantastic when author/reader collaborate and make magic happen. This was a slightly scary paranormal mystery that had a steady pace and excellent narration. I wish I had listened to Death Sight before this one so that I would have had greater insight into the main characters life and abilities. The story was still very enjoyable even without those details. "This audio book was provided by the author, narrator, or publisher at no cost in exchange for an unbiased review courtesy of AudiobookBlast dot com." What made the experience of listening to Return to Angel Hill the most enjoyable? What did you love best about Return to Angel Hill? It was a unique premise. Two psychics go to Angel Hill and find themselves tangled in with the unnatural and the bad. I just wish the ending gave us more answers on the big bad. But I don't want to ruin it for other readers. I'm glad the story had some originality to it. Will Castleton was the main character and was portrayed very well by the narrator. I got sucked into the story. And for that to happen I need to have a good enough narrator to draw me in. I will say the beginning was a bit boring, but it definitely gets better. So anyone with concerns should just keep at it. There were a few moments of creepiness that I cant help but remember. But I honestly do not want to ruin any surprises to future readers. Though I think it took me longer to review it than I should have taken, Im glad I finally listened and finished the audio. I will also say that this audio was gifted to me by the author for an unbiased review. this is a suspenful book full of cool turns and twist. Mazzi is a great main character!! I enjoyed this book; it bought back the characters from Angel Hill books (especially like Maize). It contained paranormal/supernatural and steady action. It seems there may be another book in the making as Maize has premonition into the new child Laurel and did not answer if she was going back to Angel Hill. Will is an interesting ex-cop. Fun slightly scary listen. This audiobook was provided by the author, narrator, or publisher at no cost in exchange for an unbiased review courtesy of Audiobook Blast. Thank you! This was a good read.A bit scary and a bit mystery.James Foster does a great job at narrating.I was provided this book by the author, narrator or publisher.